At first, I didn’t think that I liked the update to version 0.3 of iToday however, there are a few cool new features. One of the new features that I like really like is that you can tap on the lock screen and iToday will slide away for 3 seconds. A couple other small features include the battery level refreshing when your iPhone comes out of sleep mode, the time of the event is now displayed and the calendar will not show events that are already over. I also noticed that the Birthday’s are now displayed correctly!! That is definitely a good bug fix! The final new feature is to the actual application itself. There is now a Themes option. Right now, there are only two themes Default and frenchiphone. Though, I’m sure we will see more themes in future updates. Now, there is one thing that I really do not like about this update and that is the fact that iToday is transparent on the lock screen. I liked it much better when it had a black background. It looks ways to cluttered when it is transparent. iToday is available through the Skrew source. All background images are gone. 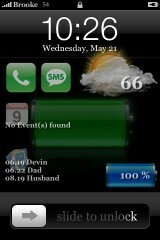 Shows info with wallpaper but no SMS, iPhone,calendar, or weather symbols???? Any ideas? I wish they had an alternative to the phone and sms icons for people with iTouches. When i desintall iToday, it still display the infos on lock screen. someone has a idea ? I don’t like this app. This one and the other “intelliscreen” are way too much. I miss having the kate calendar. Someone should develop a simple, semi-transparent calendar that when you click on it shows you your upcoming events. A stand-alone uCalendar would be amazing. Nice update. But now the icons for phone, SMS weather and battery are gone. Anyone else? The one thing I don’t like about it is that if there are no events or birthdays it says that instead of just being blank. The images were not showing up for me at first either. I actually liked it because it made the lock screen a little cleaner. If you go into the app and choose the Default theme, all the images will show up again. And the birthdays are still not showing correctly. They are all off a day. I just wish you could customize what’s shown. I really don’t like the phone and SMS icons on my lock screen. It looks crappy. For those who coundn’t unistall it, you have to disable itoday first. I think you have to reinstall it and unistall again! Yea, that’s what I had to do. The Weather doesnt exactly show the current weather. Whats it there for? The calender icon shows a different date then what is currently the date. Plus it sits behind the calender items and unreadable. ah, concerning the weather showing an incorrect temp. If you have more then one weather location set up, you have to put the one you care about at the top. iToday reads the first one in the list. Would be nice if iToday teamed up with intelliscreen or something like that. It still needs a bug fixing of the time of the events. It shows them marked at GMT instead of local time. Any ideas on this? I find this new theme for iToday, I would like to contact the admin of this site maybe you want to post it but I have not find the email form. i cant see the icons! all disapear! and birthdays are wrrong! if i have itoday, do i still need vwallpaper? or do i have to change the settings somewhere like summerboard and turn off theme or wallpaper?